He was inspired by the example set by his brother. 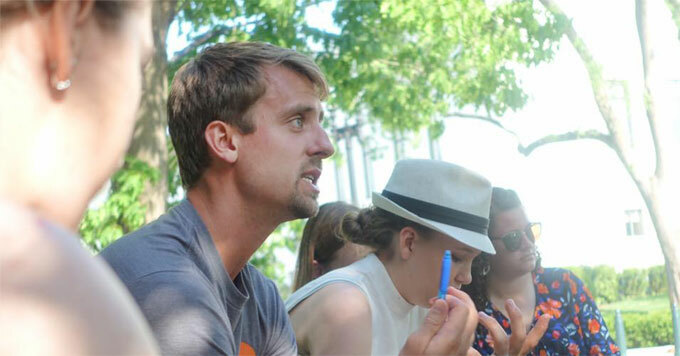 Kyle Meyaard-Schaap leads a lobby training workshop in Washington D.C. in 2017. When he was growing up, Kyle Meyaard-Schaap’s evangelical family talked very little about climate change. When Meyaard-Schaap’s brother decided to become a vegetarian for environmental reasons, everything changed. As he learned more about his brother’s reasons, Meyaard-Schaap’s own interest in climate change grew. And he was inspired to educate others – especially evangelicals like himself. Today, he’s the national organizer of Young Evangelicals for Climate Action. This network of Christians attends rallies, signs petitions, and speaks out for a cause they feel at heart is a moral calling. Meyaard-Schapp’s goal for the group is to do what his brother did for him. Reporting credit: Hannah Breisinger/ChavoBart Digital Media. Photo: Courtesy of Kyle Meyaard-Schaap.